Am I surprised that New Yorkers fancy themselves as the country’s premier destination for hot dogs? No, no I am not. They think they have the best everything. Trying to discuss pizza with them is insufferable (and a topic for another day). They’re even attempting to co-opt the BBQ crown (cue everyone South of the Mason-Dixon Line laughing uproariously). 1. They have no style. There’s a reason you find “Chicago-style hot dogs” on menus all over the country (albeit inferior ones). The flavor parade that is yellow mustard, relish, onion, tomato, celery salt, sport peppers, and a pickle spear is a perfect blend of taste and texture that complements your encased meat without overpowering it. 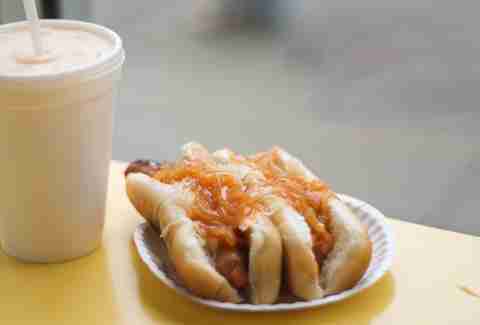 The most iconic New York dog carries the descriptor “dirty water” and comes with a pile of sad sauerkraut and regret. 2. They’ve been betrayed by their own. Anthony Bourdain lives in -- and loves -- New York. He also loves street meats of indeterminate origin. He openly despises Chicago pizza. When a man with those credentials emphatically declares Chicago hot dogs to be superior to New York’s, you know you’re fighting a losing battle. 3. We can do the haute dog thing, too. No single place encapsulates the wide-ranging glory of Chicago’s hot dog scene like Hot Doug’s (for real, watch the clip above). I’ve eaten at some of NYC’s more celebrated dog joints, and they aren’t even playing the same sport. From a perfectly executed, cheap Chicago Dog to next-level sausage creations with foie gras and other fanciness, it delivers the goods every time -- even with the hungry hordes lining up outside. Sadly, Doug is closing up shop soon, but we have Franks ‘N Dawgs and countless others to carry the torch. 4. We show them more respect. The macabre display of machine-like hot dog consumption that is the Nathan’s Famous Hot Dog Eating Contest shames the good name of hot dogs everywhere. Here in Chicago, we eat way too many of them because we lack self-control, not because of some tawdry contest. 5. Because we love them more. Hot dogs are an afterthought in New York. It’s a pizza town. I won’t get into the NYC-Chicago pizza debate, because, again, New Yorkers are a bunch of closed-minded children who are scared of pizza that’s too big for them. 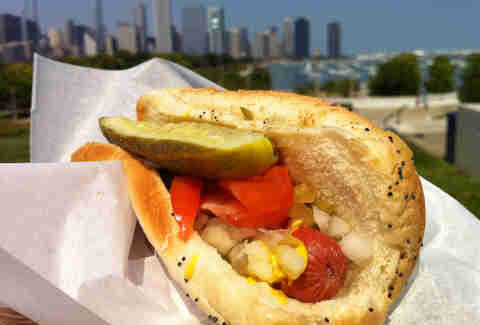 But hot dogs are essential to an understanding of Chicago’s culinary scene on a level that simply isn’t present in NYC. There are more hot dog joints here than there are McDonald’s, Wendy’s, and Burger Kings. Combined. So it should shock absolutely no one that we do them much, much better than a certain self-important city out East. I don’t blame Chicago, really. NYC overshadows the Second City in every way: pizza, baseball, buildings… on and on. But this is no pity party, and facts are facts (especially when they’re opinions! 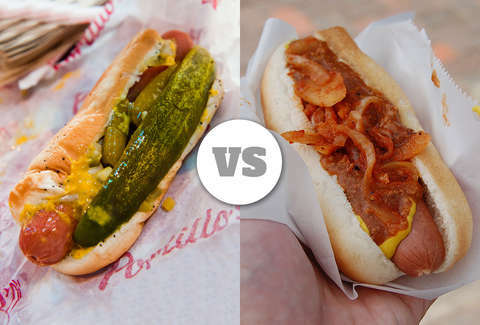 ): Chicago’s proud hot dog heritage is but a gimmick-riddled bush league next to New York City’s winning wiener tradition. 1. They’re pitifully insecure. I read a book called The Devil in the White City once. You know what I learned? Historical nonfiction can be fascinating when given a proper narrative arc, serial killing is bad, and the World’s Fair was a cultural oddity even before it landed the MIB UFOs in Flushing. Oh, and also: Chicago is full of a bunch of wiener-measuring blowhards. Chicago has always been New York City’s adorably fat little brother, clamoring for recognition as equals despite our frank superiority. (DO YOU SEE WHAT I DID THERE?!) The thing is, Gothamites don’t beg the world to pay mind to our gangland pedigree, our skyscrapers, or even our hot dogs. We just wake up every morning and dominate, while The Chi pathetically plies airwaves/bandwidth with meager "me-toos". We get it: you make hot dogs too. Congratulations, dorks. 2. They taste like fermented salad. Chicago favors the “dragged through the garden” approach to toppings, which means your dog (normal or char) will arrive buried under more pickled produce than you’d find in a Bushwick loft during jarring season. Here in New York, we don’t hide our dogs beneath an avalanche of flavor-masking greenery. If the water’s dirty, we want to taste it. Sauerkraut and relish -- no problem. But once you get into tomato and “sport pickle” territory, you’ve crossed from “convenient street food” to “sloppy hassle”. And have fun getting those poppy seeds out of your teeth. At this point, Chicago’s hot dog apologists usually swoop in with allegations of NYC’s “dirty water” storage method. Yes, our carts keep their dogs in vats of warm water. No, it doesn’t bother us. There are germs all over this town, and we aren’t afraid of ‘em. Welcome to the big leagues, Loopers. 3. Coney Island… ever heard of it? Every Fourth of July, the world’s finest athletes descend on Brooklyn’s original Nathan’s Famous stand to showcase their fearsome hot-dog-housing abilities. It’s pretty disgusting. We don’t generally enjoy watching it. But regardless, this frankfurter fiasco doesn’t go down on Lake Michigan’s shores, because Coney Island is the world’s one and only cased-meat capital. 4. We don’t stress you out with a bajillion decisions. Out there in the hinterlands, ordering a dog is a high-tension process. Beyond those ridiculous toppings, you’ve gotta deal with silly minutiae like cooking method (water vs. char) and condiments (mustard, celery salt, or, if you want to get rudely heckled FOR NO REASON, ketchup). Don’t even get us started on Hot Doug’s; it’s admittedly delicious, but it’s also an outrageous choice-vortex/stress-fest that's miles into the suburbs. New York City doesn’t have time for your hot dog preferences. We make our dogs lean & mean, give you a no-judgement selection of reasonable accoutrements, and then send you on your way. Our dog is “coffee, black”; Chicago’s is “half-caff macchiato with two pumps of low-sugar hazelnut syrup and a small spoon to gently agitate the raw sugar”. Lame. 5. And finally: we have the best of everything. It only stands to reason that our hot dogs are best-in-class. Hate us if you want, but we didn’t ask for this. We’re just out here making it happen every day. Take a couple practice swings before you step into the box, Chicago. NYC’s hot dog is pitching real heat. Matt Lynch is a senior editor at Thrillist from Chicago who once enjoyed a lovely meal of encased meats there with Dave Infante, who is now dead to him. Follow their showdown at @MLynchChi and @dinfontay. Adam Lapetina is a staff writer for Thrillist, and put these two in a room sans hot dogs, which was obviously a mistake. Follow him at @AdamLapetina.